Fondly Recalling Don’t Stave & Still Waiting for the Cartoon! From one foodie to another, midnight snacking is heavily encouraged in Klei Entertainment‘s video game, Don’t Starve. This product arrived on multiple platforms back in 2013, and from time to time I come back to playing this game, especially when the nights are long (mirroring the game), I feel isolated from the world at large and feel very, very alone. Since then, this product has expanded into new directions. The Shipwrecked edition had me thinking of Théodore Géricault’s majestic painting, The Raft of the Medusa. In the original game, my avatar (known as Wilson) is wandering through an arcane world steeped in Victorian mysticism. Coming later this year is Hamlet, and the Shakespeare in me is very excited to see how this play is going to be adapted into video game form. This company has been busy with developing other properties like Oxygen not Included and Griftlands; their visual style is what keeps me coming back to the company webpage to admire what’s next. 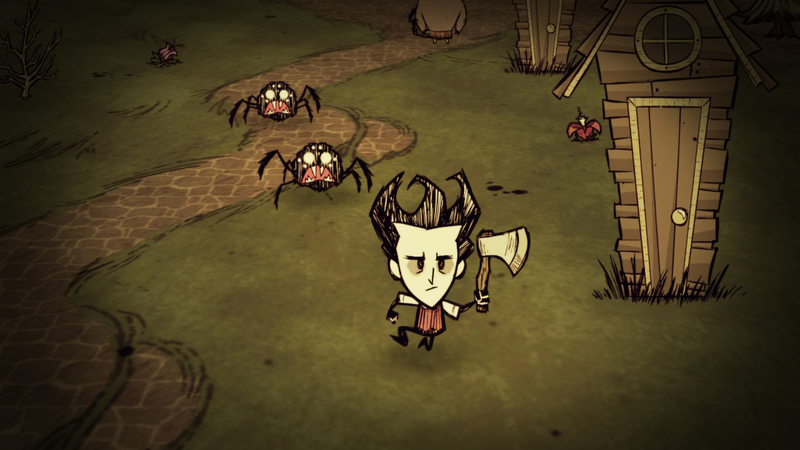 With their core game, Don’t Starve has a strong cult following, yes I’m left hungry for more. The mega-pack (available on Steam) has everything I need to melodically continue squealing to. That is, these characters squawk sound like they belong in a Peanuts cartoon. Much of the dialogue is told in subtitles and it reads like something that Wednesday Addams would say. Much of the visual style draws upon a pop-up storybook approach in rendering its in-world architecture. This world is getting bigger, badder and it really needs a cartoon or web series to continue the love. Even the music is very driving. I’m sure the talents behind this aspect of the game can do great things with the moving picture medium. The tunes have a vibe found in many a Danny Elfman score. Since this product also gets its inspiration from various other sources — from television with Star Trek, The Original Series (“Arena”) to Survivorman — I feel this product is ready for a narrative to draw in new players! For those unfamiliar with the main game, the goal of this game is to keep the hero, Wilson, alive. He will have to trek across dangerous terrain in search of resources to feed upon, build weapons from and set up defensive lodging with. Along the way, he will meet up with inhuman creatures. Those monsters that go bump in the night may well be all the more terrifying when Wilson’s imagination goes wild. Part of this game’s appeal is because it trends in classic horror film territory. Part of it is inspired by E.A. Poe’s sense of impending dread and the rest follows H.P. Lovecraft’s sense of how one’s world can simply collapse upon itself when sanity is lost. Other characters can be played and they each have their unique abilities. Willow is immune to fire and Wolfgang has a higher health. Each character can help survival last longer.